Max had always felt a little different from the rest of his siblings. Not very useful, even. He wasn't super smart like Six, magical like Patches, or extremely kind like Winter. He was just boring old him. At least, he was, until he discovered his true calling. Max could clearly remember the first time he visited Moltara. Discovering the Moltarans’ way of life and their skills with tinkering had awoken something in him, and he had finally found a hobby that he loved and was good at. Max had practiced for a while, and then he had taken the family toaster apart, which his owner hadn't been too thrilled about. However, she forgave him after he put it back together and modified it so that it played music while you were waiting for your toast. Tinkering with things was fun, but Max wanted the Moltaran look to match. He was drawn to the Magma Pool, with its fiery glow and mysterious power. The Xweetok had started to hate his blue and white Cloud colouring. It matched his homeland of Terror Mountain nicely, but the colour just wasn't him. The problem was, getting into the pool had proved to be nearly impossible. Max had, of course, tried to get past the guard on many occasions. His attempts were always met with increasingly angrier claims that he wasn't well-versed in the ways of Moltara. He was starting to be convinced that this guy just wouldn't let anyone in, even someone who had lived in Moltara their whole life. Frustrated with his lack of success, Max had finally decided to persuade his siblings to accompany him to Moltara this time, in the hope that they could succeed where he failed. This turned out to be not as easy as he thought, as both Six and Winter had to be dragged away from the bookstore and Patches started to freak out a bit at the heat. 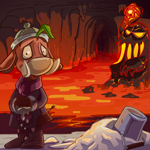 "Bori were not designed to spend any amount of time in burning lava pits of doom," Patches muttered, checking her witch’s hat as if to make sure it hadn't spontaneously combusted. "I've never been so glad that I'm not Snow anymore," agreed Winter as she fluttered her Faerie wings nervously. "Well, it certainly is a contrast from Terror Mountain," added Six. "But the sooner we do this, the sooner you can get out of here." Max sighed. "Remind me again why I thought it was a good idea to bring you all along?" "Because the Magma Pool guard hates you, so you need all our talents to help you sneak in!" responded Six with a grin. "I don't think he hates me specifically. He just enjoys crushing people's dreams." Everyone quieted down as they drew closer to the deepest part of Moltara. The bright red-orange glow of the Magma Pool lit up the cavern like a giant lantern. It would have been a more beautiful sight if it weren't for the angry spear-wielding Tonu standing at the gate with a gaze that burned into you hotter than magma itself. "I'm going to go talk to him first," Max said quietly. "You guys stay out of sight so he doesn't know you’re with me." His siblings nodded and ducked behind a conveniently located pile of rocks. Max sauntered up to the guard with all the confidence he could muster. "Hello, sir! What a lovely day for a swim in some magma, isn't it?" The guard scrutinized the Xweetok carefully, taking in his bright blue and white colouring that stood out sharply against the red and brown of the caverns. "You again." he stated flatly. "I've been studying even more Moltaran tinkering techniques," Max added quickly. "Look, I built a toaster that can also play music." He handed the object to the guard, who stared at it unblinkingly. "I'm sorry, only those well-versed in the ways of Moltara are permitted to enter the Pool. Learn more and try again later." Max sighed at the Tonu’s too-familiar words and turned around, trying to look completely defeated. "That went well," remarked Patches sarcastically once Max was safely back behind the rock pile. "It didn't have to go well, as long as I have you guys," Max responded. "Six, you’re up." The Lupe brightened. "You need me to impress him with my extensive knowledge of Moltara to get you access to the pool? Gladly." "Actually, I was thinking more along the lines of "bore the guard to sleep," but I guess it could work either way." "Wow, Max, you're sure doing a great job of convincing me to help you. I might as well just leave right now!" Six turned around with a playful flick of his tail. Patches rolled her eyes. "Can you stop messing around, guys? I don't want to spend any more time here than I have to." Six walked up to the guard with a smile. "Good afternoon, sir. I was wondering if you had the time to discuss this old Moltaran legend that I read about recently? I found it quite fascinating…"
The conversation that followed was rather long and tedious for everyone else, but the guard was actually smiling as he discussed the lore. "Wonderful! You're quite a scholar," the Tonu remarked. "So, would it be possible to access the Magma Pool now?" Six asked hopefully. "No. Have a nice day." the Tonu responded with a pleasant smile. "I was, uh, actually asking for a friend." Six walked back to the pile of rocks in a daze and was met with equally astonished expressions all around. "I genuinely thought that would work," Winter said. "It's okay," Max grinned. "I'm not out of ideas yet." He turned to Patches. "Sorry for dragging you all the way here, but I need your help. Just use your magic to incapacitate the guard, and we'll be out of here in no time." His sister's eyes widened in shock. "Wait, your plan is for me to cast spells on an on-duty guard? That's probably illegal! I don't want to go to jail, especially not Moltaran jail!" "Uh, okay?" Max responded, taken aback. "Can you just distract him or something, then?" "I guess so," Patches muttered. She raised her hand and pointed it at the wall of the cavern. Nothing happened for a minute, and then the cliff started to rumble. An avalanche of rocks tumbled down with a boisterous clatter. The guard looked up briefly, saw that nothing was actually going to land on him or in the Magma Pool, and didn't budge from his spot. "Well, I suppose it's my turn, isn't it?" Winter remarked hesitantly after a few moments of stunned silence. "Of course, dear sister," Max said with a smile. "How much weight can you lift?" "I was afraid you'd say something like that…" the Faerie Xweetok sighed. "I can't guarantee that I can carry you far enough, but I guess it’s worth a try." Winter grabbed her brother and leaped up into the sky (or at least what passed for sky in Moltara). Her wings beat heavily with the effort, but they were soon able to approach the edge of the pool from above. She dove for it, and Max closed his eyes in anticipation of the drop. Instead, there was a muffled thump as they collided with something unexpected, and the two Xweetoks found themselves lying on the floor of the cavern. "There's an invisible barrier. Of course there's an invisible barrier," Max grumbled. The Tonu was looking at them and shaking his head in disappointment. Max and Winter slowly trudged back to the rock pile, which the guard had almost certainly noticed was their hiding place by now. "Well, I'm out of ideas," Max declared. "Anyone else?" "Well, I'm the only one he hasn't seen yet," Patches said thoughtfully. "Maybe I could go up to him and tell him he has to leave because I'm a magma scientist who's here to conduct important experiments?" "The correct term is volcanologist," supplied Six. "And you look much less like a scientist than like an angry witch who would rather be on Terror Mountain, which is, in fact, what you are." Patches sighed. "I could use magic to make myself look like a scientist, you know. Personally, I'm in favor of you going back and actually boring him to sleep this time." "Guys?" Winter piped up tentatively. "I don't think that's going to be necessary…"
Everyone turned to look where she was pointing and saw that the guard’s head had slumped over, and he appeared to be...snoring? It was almost too good to be true. "I can't believe it!" Max whispered excitedly. He took a few cautious steps out from the rocks. The guard didn't move at all, so Max dashed over as quietly as possible until he was standing right in front of the pool. He slipped between the guard’s spear and the right side of the gate, and launched himself into a flying leap towards the bubbling pit. Wait a minute! Max’s brain screamed at him. How do you know this is actually magical magma? What if it's real magma, and the guard’s there to keep everyone out of danger? Of course, at this point it was too late to go back, and he plunged into the pool with a noise that sounded partly like a splash and partly like the crackling of a fire. The first thing Max noticed was that he was definitely alive, so this was probably magical magma. Either that or it was real magma but he was somehow completely invincible, which would actually be even more awesome now that he thought about it. Of course, that was just silly, but it's hard to think clearly when you've just thrown yourself into a pit of lava. Max could feel himself surrounded by a strange aura that reminded him of when he had dived into the Rainbow Pool with a Cloud paintbrush long ago. This was somehow different, warmer and more comforting. He felt as if the very essence of Moltara was pouring into him, warming his fur like an intense but gentle ray of sunlight. After what felt like an eternity, but was probably only a few seconds, Max burst out of the pool in a bright blaze of fire. The guard was miraculously still asleep, and Max didn't feel like sticking around to see his reaction when he woke up. His siblings congratulated him excitedly, while making sure to stay far away from his molten fur. "How do you feel?" Patches asked. "And don’t you dare make any jokes about being hot." "I feel… well-versed in the ways of Moltara." Max responded with a bright smile. As they made their way back through the caverns, Max admired the way his fur resembled the pool itself, casting a soft glowing light on the walls. The sun had set by the time they all arrived at the surface, but there was no need to worry about going home in the dark. The Xweetok’s Magma glow was like a guiding star in the night. As he led his siblings back towards the mountain, Max finally felt like he had become who he was always meant to be. His happiness was interrupted by his brother. "Wait a minute," Six said, stopping in his tracks. "Where's the musical toaster?" Everyone looked around frantically, but it was nowhere to be found. "Oh well, I can always make another one," Max said, undeterred. And so the four siblings resumed their journey home, excited to tell their owner about the unusual adventure they had experienced. Deep in the caverns of Moltara, a Tonu still stood in front of the Magma Pool, keeping his unending watch. Quiet music drifted from a rectangular object at the guard’s feet, and a small smile was on his face as he bobbed his head in time.